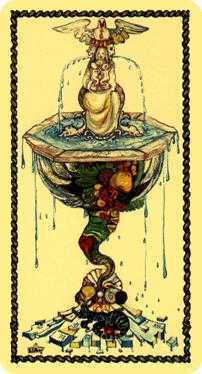 A fountain of abundance nourishes your life. 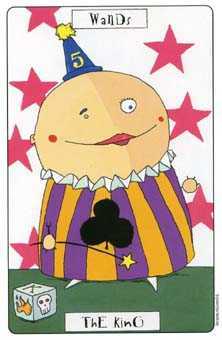 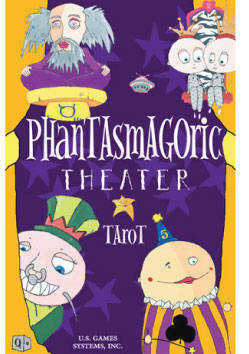 Phantasmagoric deck © U.S. Games Systems, Inc. 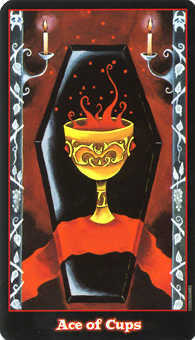 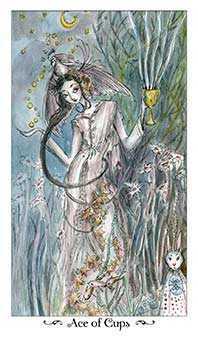 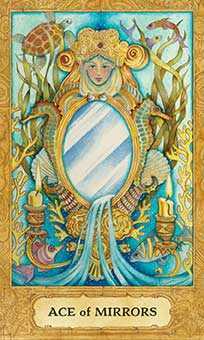 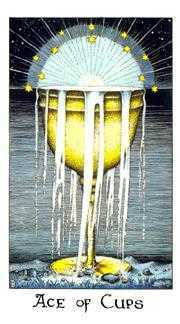 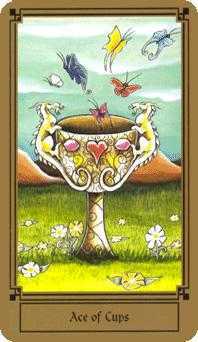 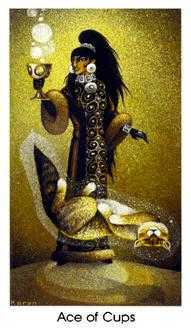 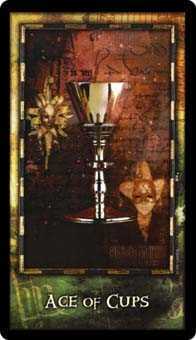 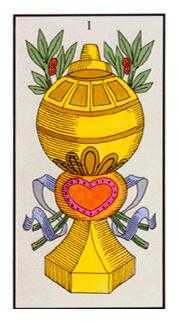 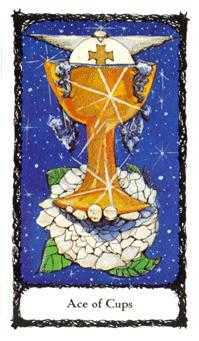 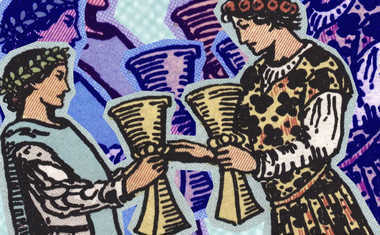 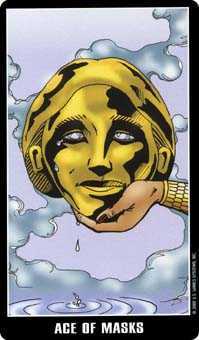 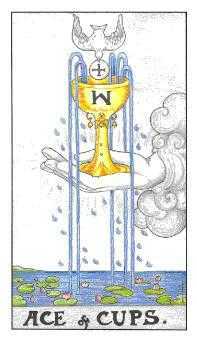 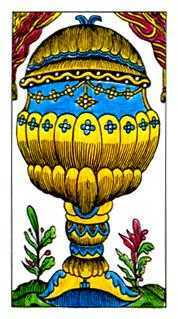 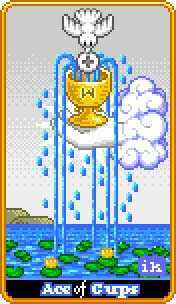 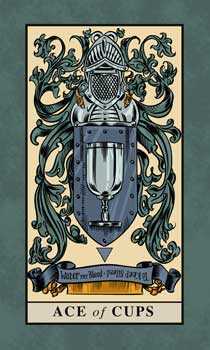 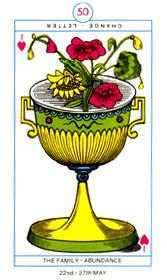 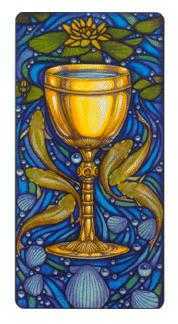 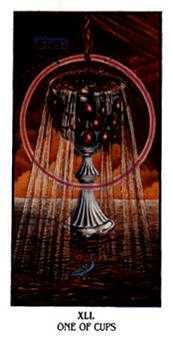 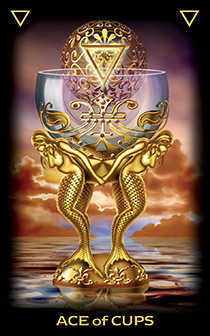 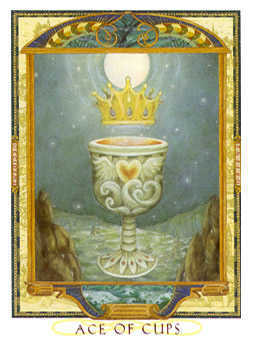 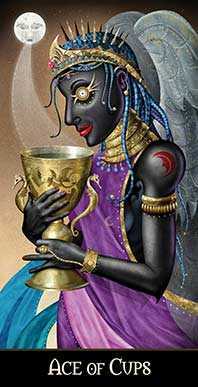 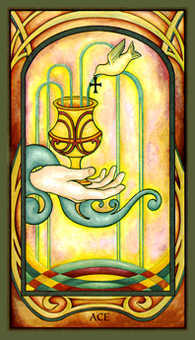 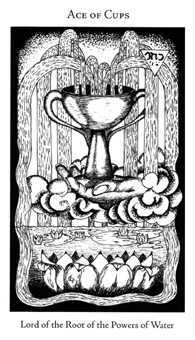 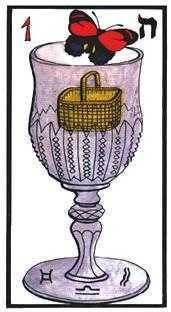 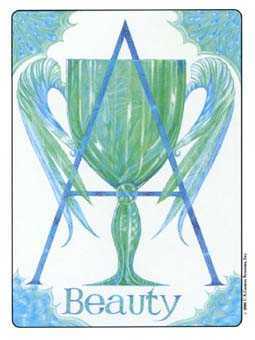 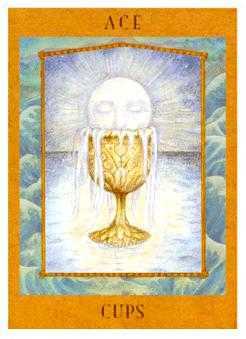 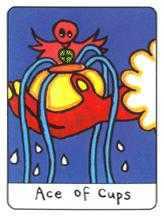 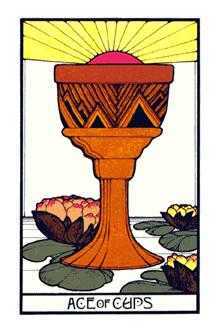 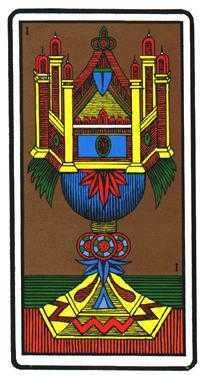 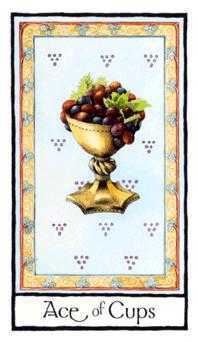 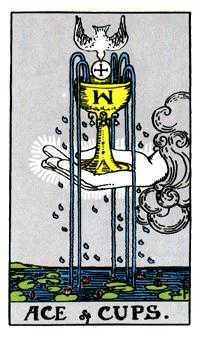 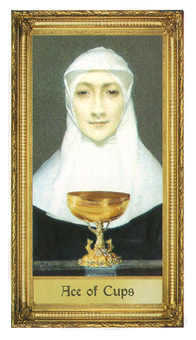 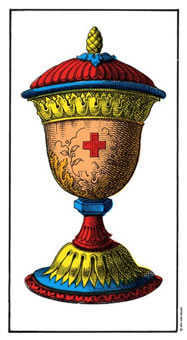 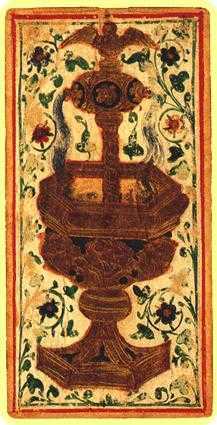 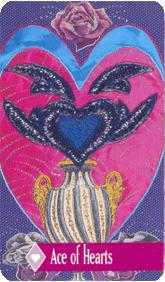 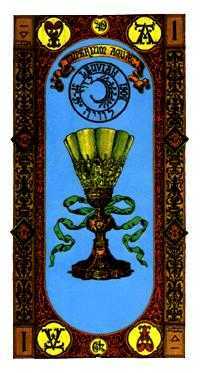 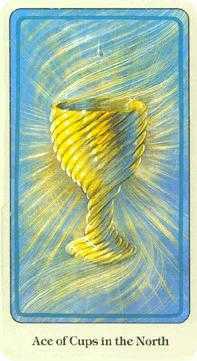 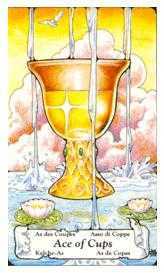 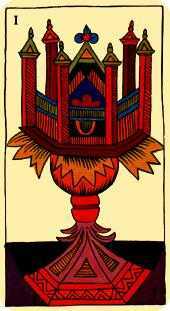 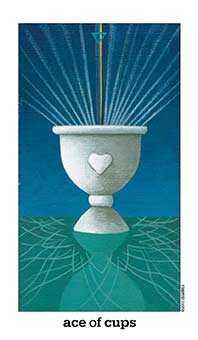 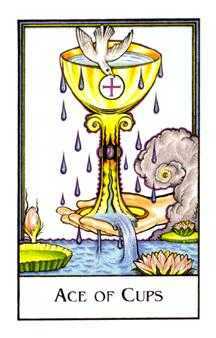 The suit in Tarot known as Cups is also referred to as Chalices or Hearts. 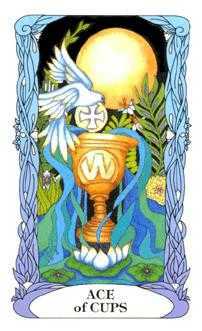 It represents the emotional and psychic aspects of life -- fantasy, imagination, feelings, love. 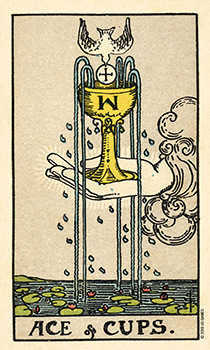 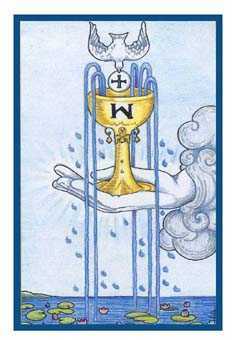 An Ace of this suit in this position generally shows a hand holding up an overflowing cup, which gives forth an endless stream of water, wine, blood or soma for the people's refreshment and healing. 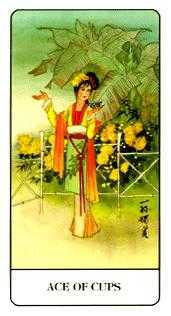 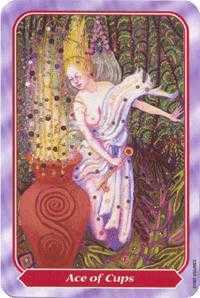 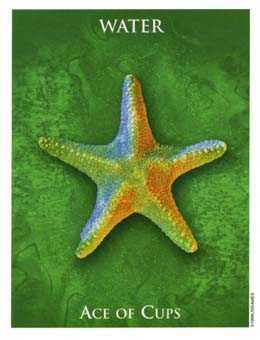 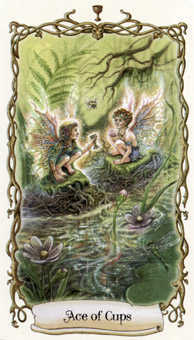 This card represents an unfailing source of balm for body, heart and soul. 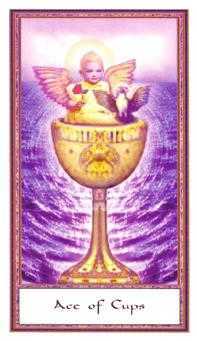 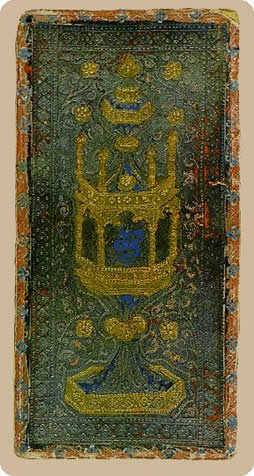 It suggests that you can relax into a safety net of love, support and communion. 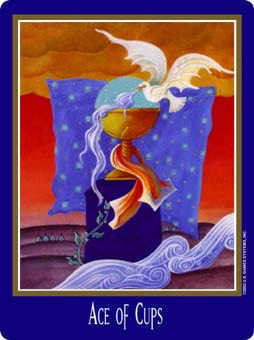 Remembering that each person and event may possess a precious gem hidden inside. 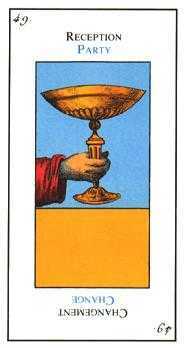 Make a conscious effort to find it. 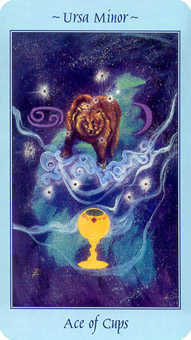 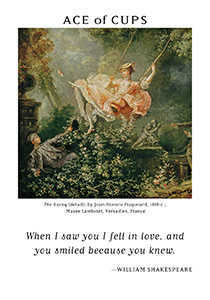 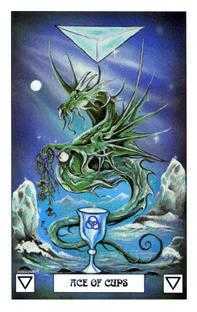 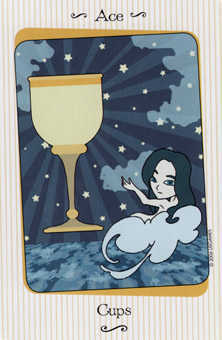 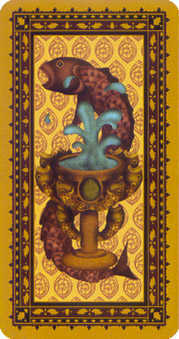 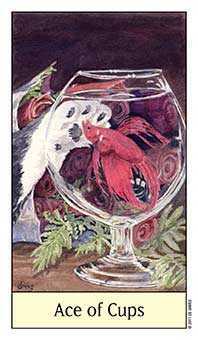 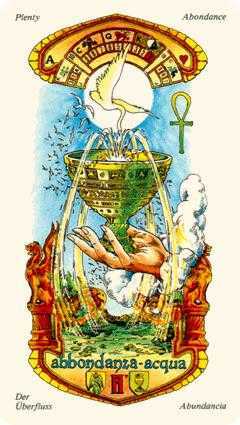 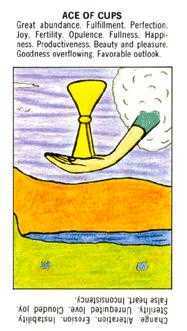 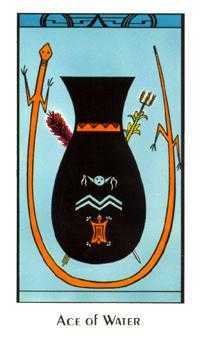 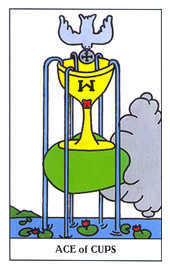 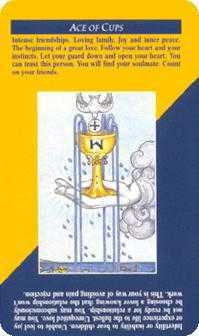 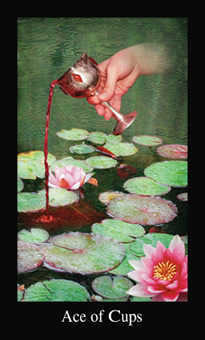 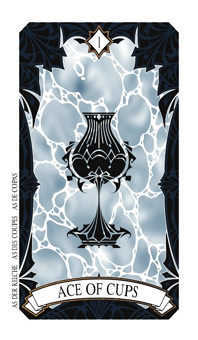 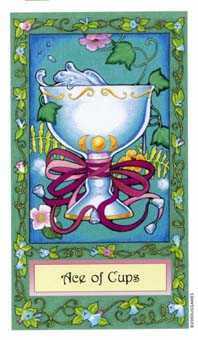 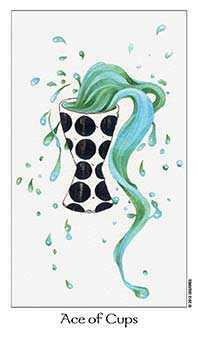 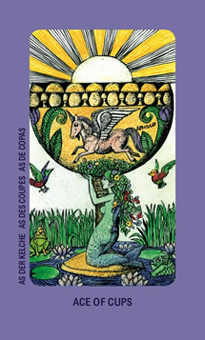 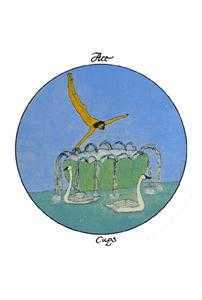 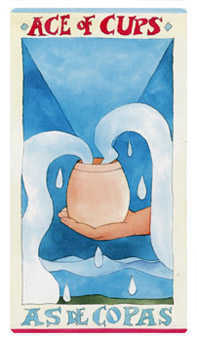 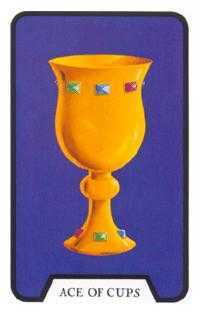 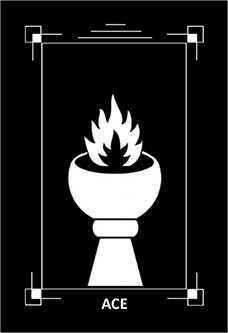 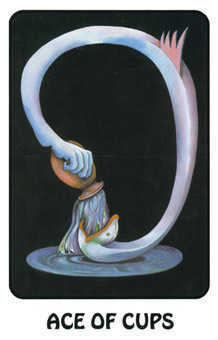 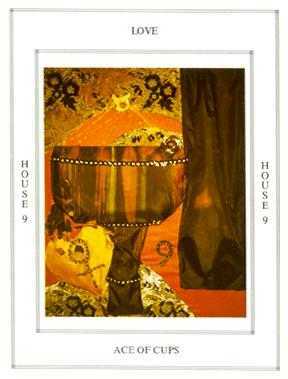 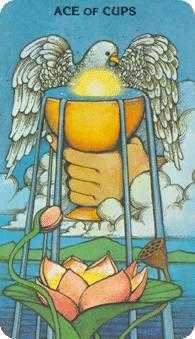 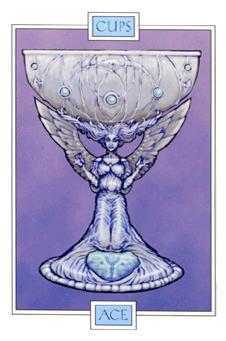 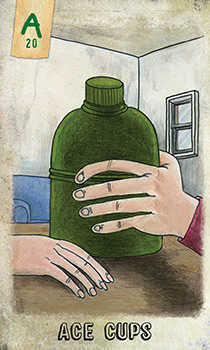 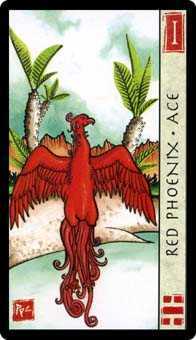 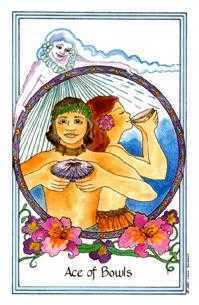 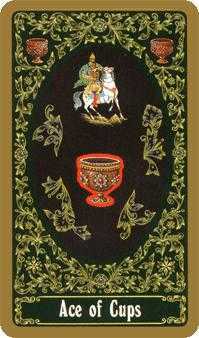 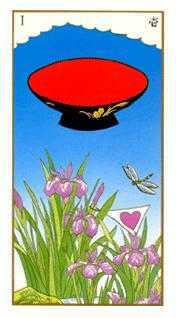 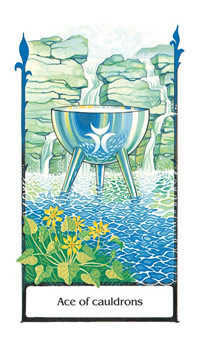 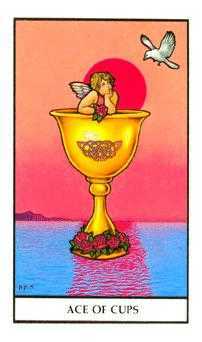 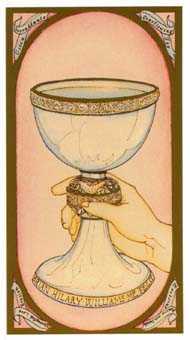 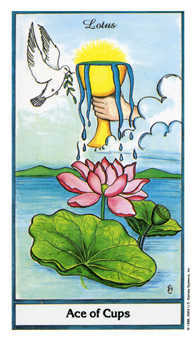 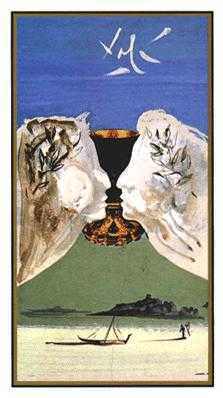 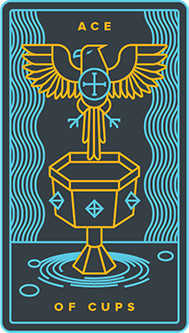 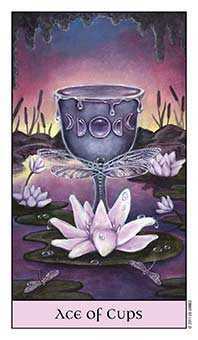 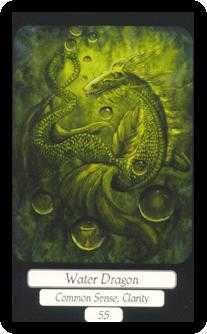 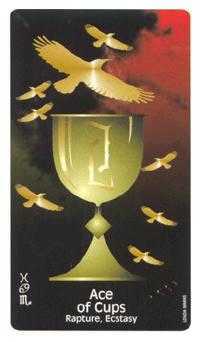 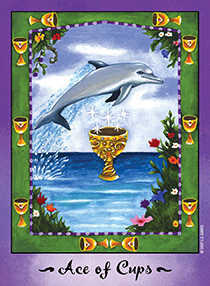 The Ace of Cups in this position advises you to challenge yourself and discover what is good about every relationship. 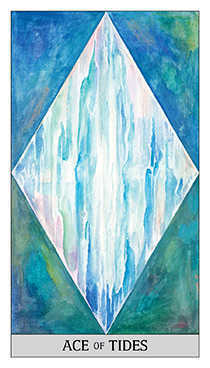 Practice looking at the world through the eyes of the Divine. 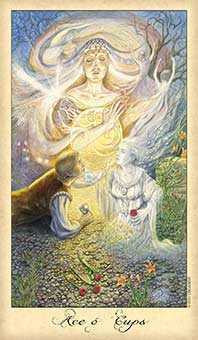 Allow your imagination to perceive the spiritual or evolutionary potential in every person and experience. 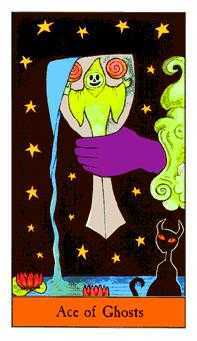 Look with the eye of a loving parent or companion upon the people and things you come into contact with. 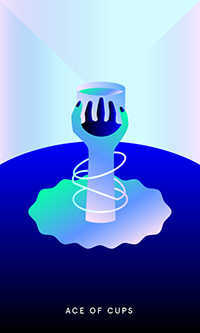 Make a conscious decision to approve of and delight in even the quirky developments that make the world turn. 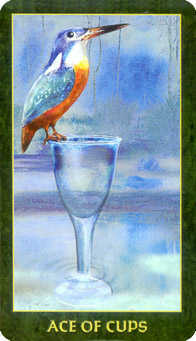 No one can be perfect at such unconditional acceptance. 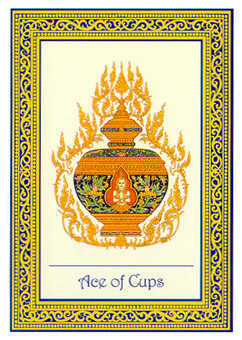 Still the practice will sweeten your day to day life. 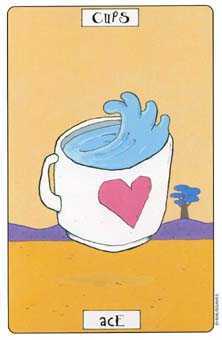 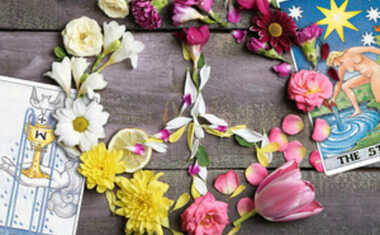 Your magnetism will increase and more loving people may enter your life. 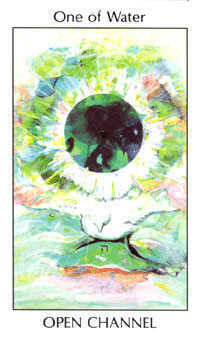 The whole world will benefit as this becomes second nature to you.